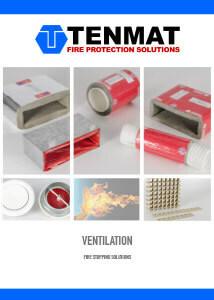 TENMAT FF109 CE Marked Vent Duct Fire Sleeves provide 30 minutes, 1 hour, 2 hour and in certain applications up to 4 hours Fire Resistance to rectangular PVC vent duct penetrations, and are suitable for all common sizes of vent duct. The compressible 25-30mm thick material offers excellent fire performance combined with accommodation for deflection. 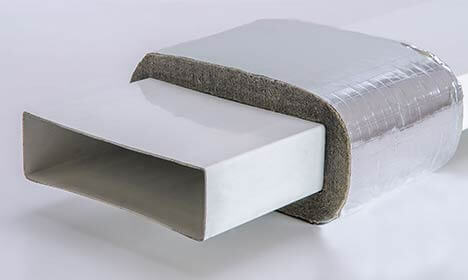 The Sleeves do not require any additional metal sleeving and are held in place by the plasterboard/batt only. The unique intumescent material is vacuum formed to a shaper which ensures controlled sealing of the duct. In addition, the material swells externally to provider a fire and smoke seal around the sleeve. The Fire Sleeves have been full scale fire tested to EN 1366-3:2009 & BS 476. The EN fire testing included all ducts tested with Uncapped/Uncapped (U/U) duct end configuration as required for ventilation ducts. The European Technical Approval (ETA-12/0332) and EC Certificate 1224-CPR-0341 enables the range to be CE Marked and used through the EU. The product is available to suit 110×54, 204×60, 220×90, 234×29, 308×29, 100, 125 and 150mm ventilation ducts and can be used on multiple, side by side rectangular duct penetration including in solid walls and plasterboard partitions.